There are so many things about our lives that never get settled or worked out in a way that we like. Many days end without resolution. I don't know about you, but I like knowing that I can visit a place where every problem, however minor, gets neatly solved (with a moral lesson to boot!) in twenty-one minutes. That is the Andy Griffith Show for me....a place from the past that gives me great comfort. 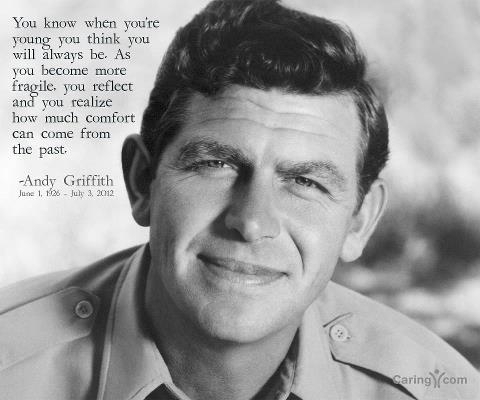 Remembering Andy Griffith on what would have been his 87th birthday. We lost a true southern gentleman with his passing last year.